What Is The Most Versatile Virtual Reality Camera For Sale? Most VR cameras available today are so expensive that they can’t even be bought. Literally. They are rental only. Still, if you look closely you will find a few options that combine the high end VR technology with a friendlier price tag. Unsurprisingly, they quickly became immensely popular. Samsung Gear 360 VR Camera is one such cam, highly praised by experts because it can shoot in 4k. It has lens on either side which work together to create a perfect spherical image. The downside is that this camera only works with Samsung smart phones. 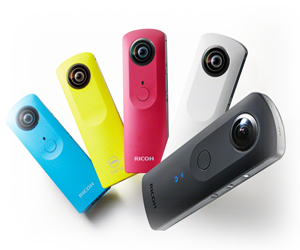 If you’re looking for a more versatile virtual reality camera for sale you might want to check out the Ricoh Theta S Digital Camera. This is actually your cheapest option in terms of VR cams, but it’s a good choice because it’s extremely easy to use. This makes it the perfect option for people wanting to get familiar with the VR world. Unless you’ve been in a trance for the last couple years you must have heard that Samsung has decided to enter the elite group of companies that produce VR equipment. Samsung Gear 360 VR Camera is the VR camera Samsung designed for regular people with an interest for virtual reality, that are not necessarily professionals looking to record footage worthy of a film award. It’s rather the type of camera you would bring with you on vacation to build a graphic memory of the places you’ve visited. This camera is perfect for shooting the inside of a church or the room of a museum you’re visiting. If you want to edit your videos or to share them with your friends it’s easy to do so by using an app available for download on your Samsung smart phone. You will be amazed of the quality of the images this little cam records, especially considering that it only costs about 400 dollars. It’s not that long ago that most people hadn’t even heard of virtual reality, but today VR is on everyone’s lips. The products that incorporate this type of technology have not gone mainstream yet, but their niche is rapidly expanding as more and more people get hit by the VR craze. Once that happens, there is no way out. The new VR fan has no choice but to adapt to the requirements of his new hobby, which includes purchasing the necessary gear. A virtual reality camera system would be the first thing to buy under these circumstances; and not just any camera system, but one that can live up to users’ expectations offering great quality video and a variety of features that will blow their minds. Such cams are not particularly cheap, but as the market develops these devices will most likely become more accessible to people with an average income.